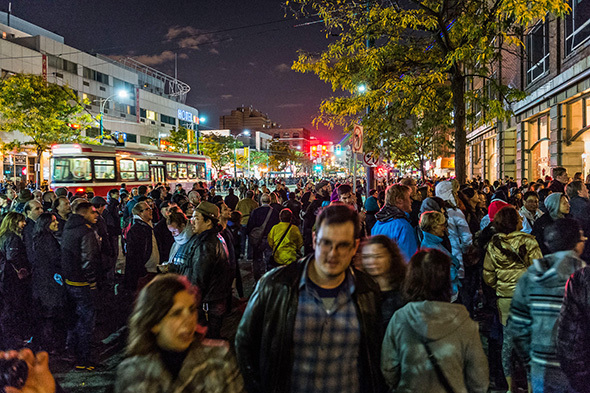 Nuit Blanche 2014 displayed both the event's power to bring people onto the streets of Toronto for a cultural experience and also the organizational challenges faced by an undertaking of this size. What attendees got out of the all-night art affair likely had a lot to do with the expectations that they had going in. Those who were confident that they'd witness a series of thought-provoking art installations were probably disappointed. As the years have passed, the exhibits have tended more and more towards flashy spectacle with little substance or attempt at subversiveness. Those who thought that new zone locations would reinvigorate the event likely also went home tired and unfulfilled. Though promising on paper, neither a semi-closed down Spadina nor an installation-filled Fort York managed to better previous years in which the ample public space of the Financial District has been put to good use (never thought I'd say that). 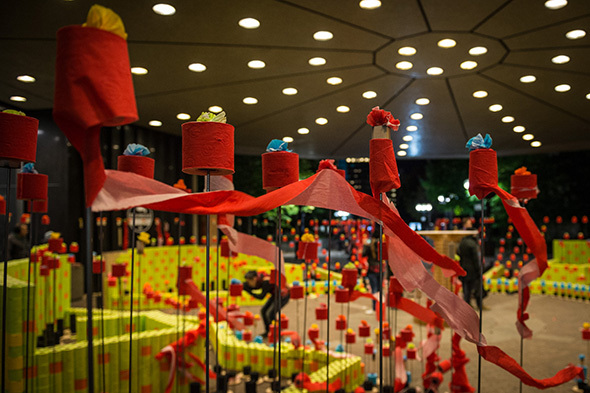 Attendees who were looking to hit the town late into the night, see a bit of art and have a raucous time, however, probably felt that this year's Nuit Blanche was just fine. The crowds were as dense as I can recall, and the party element was as visible as it's ever been. Perhaps a bit of booze or greenery was precisely what was needed to make the trips between exhibits -- which seemed further spaced out than in the last few years -- more palatable. 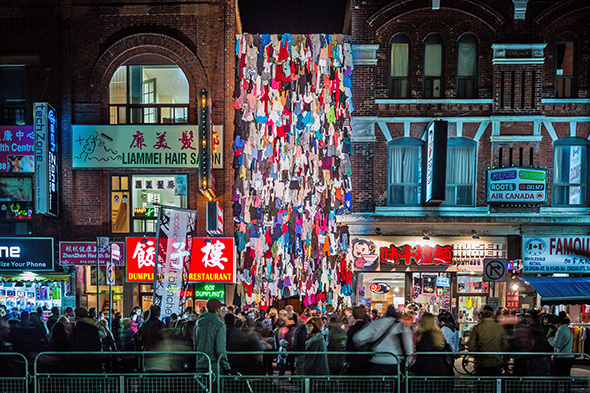 Here is the best and worst of Nuit Blanche 2014. The laser beams shooting out of the CN Tower towards Chinatown didn't look so amazing from the side walking up Spadina, but like any good rainbow, when you found the end, there was a treat in store. Another installation with global registers, Maria Ezcurra's project also relies on scale, this time to shed light on the socio-economic underpinnings of the neighbourhood in which the exhibit is on display. Featuring thousands of garments bearing the tag "Made in China," the piece gestures to the complicated connection between the East and West. MÃ¡ximo GonzÃ¡lez's 7,000 beach balls, sprouting out in clusters that resemble the tissue in human lungs, were both worthy of critical thought (the balls were divided in three sizes to represent differing global economies) and stunning to look at. 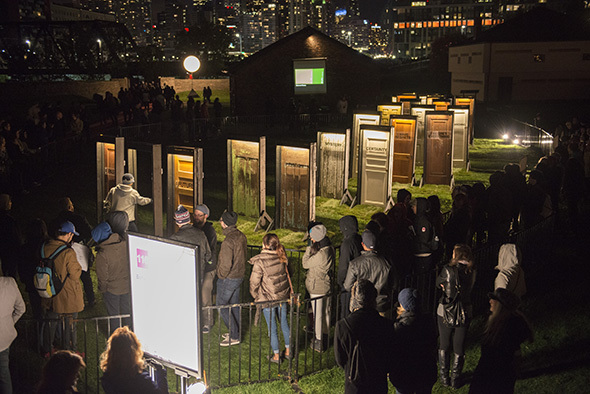 Take note future Nuit Blanche curators; this is how it's done. Part reference to Houdini, part commentary on the mundanity of everyday life, Holoscenes aquarium performers were fascinating to watch go about their business as if they weren't about to drown. The apocalypse is coming; better get ready. Upon arrival at this installation I was immediately underwhelmed. Why would anyone line up to pass through an array of doors with arbitrary choices on them? After a couple minutes of listening to crowd chide people for their choices, however, the whole thing made sense. "Why is everyone in love," wondered someone at the popularity of this particular door. Why indeed. Getting out of the Financial District might have seemed like a good idea to organizers, but the new zones along Spadina and in and around Fort York were underwhelming to say the least. 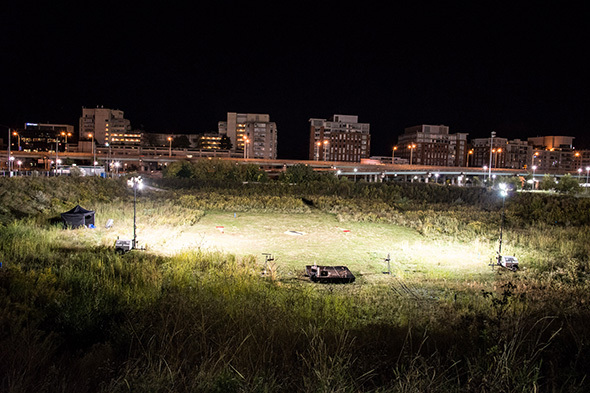 Fort York is a site that brims with potential for something like Nuit Blanche, but numerous video installations and the small scale of projects just didn't captivate. Worse, Spadina was only closed on the west side, which led to overcrowding, close encounters with streetcars, and, at times, mass confusion. Tied, no doubt, to the experiment with new zone, the spacing of the exhibits this year posed a challenge. Walking up Spadina from Fort York to Queen, there was very little to see. That proved unfortunate for those headed northeast from Before Daybreak to the Possibility of Everything. While it shouldn't be forgotten that corporate sponsorships help to make cultural events like Nuit Blanche possible, it'd be nice to see a division between church and state when it comes to the exhibits. Luigi Ferrara's Garden of Renova certainly looked cool, but this type of product placement is worrisome trend. Yes, the crowds of Nuit Blanche make for a serious strain on our public garbage and recycling bins, but the city just looked like a complete dump the next day. 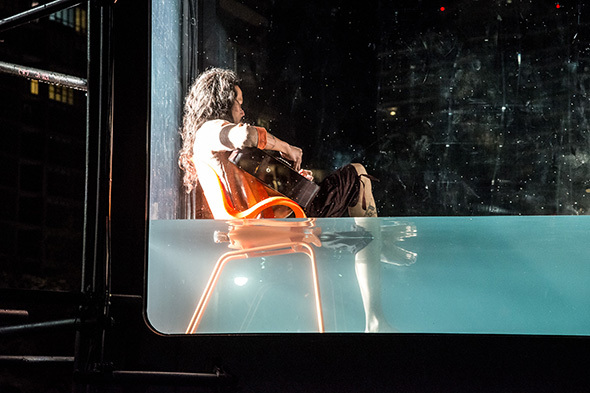 All this does, of course, is contribute to the notion that the night is all about licentious partying at the expense of appreciation for the art on offer. 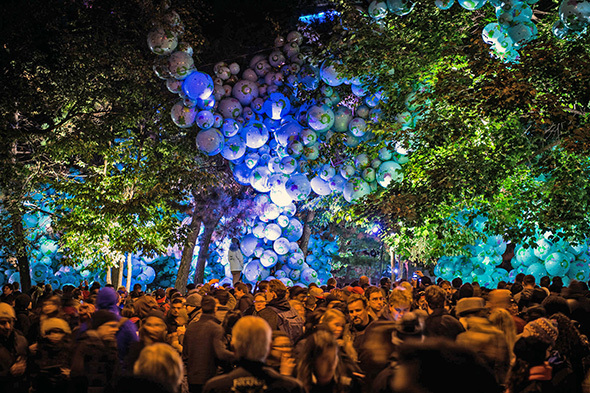 What were your highlights and lowlights from Nuit Blanche 2014?